Approx. 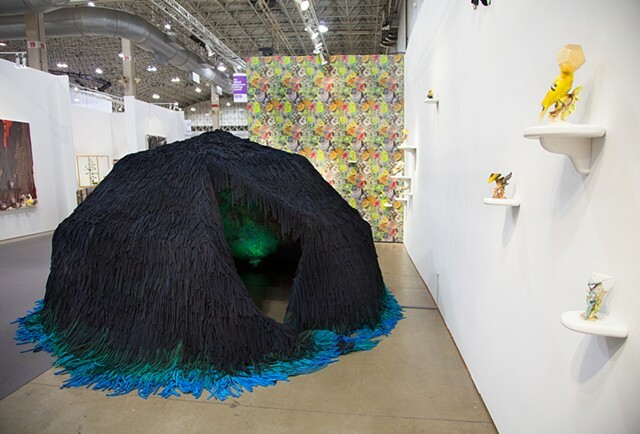 6 x 11 x 11 ft.
Tell it to the Birds, an exhibit of new work by Jenny Kendler, was created during her position as artist-in-residence (April 2014-2015) with environmental advocacy non-profit Natural Resource Defense Council (NRDC). The project debuted at NRDC's booth at EXPO Chicago: the art fair held each year on Chicago's Navy Pier, attended by over 40,000 people. The main component of the exhibit, the eponymous work Tell it to the Birds, is a 10ft interactive sculptural-structure in which visitors were invited to make a secret confession to the natural world. Guests used the provided Field Guide, which doubled as a take-home poster, to choose from one of 11 threatened and endangered birds. They then entered the private structure and spoke into a forest-scented lichen 'dish' concealing the microphone. Their confessions were live "translated" into birdsong, and played to both them and others waiting outside. The laughter-like call of the Prairie Chicken was a visitor favorite, and often prompted the speakers to laugh back. Other guests emerged in tears, their never-before-spoken secrets shared in the voice of the Streaked-horned Lark or Rufa Red Knot. A mother teared-up while listening to the voices of her two young children 'as birds,' saying that given the way humans were treating nature, she was worried that few bird species would remain when they were adults. There was a significant line for most of the four days, and it was a surprise to all of us to have so many moving experiences at a commercial art fair.